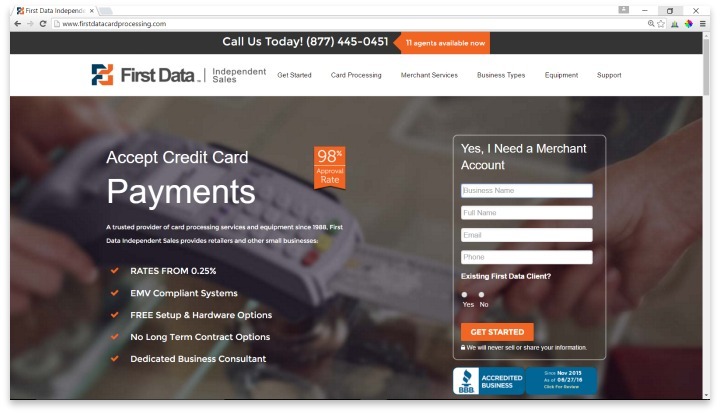 First Data Corporation was founded in 1971, and while headquartered in Georgia, provides payment technology to business owners all over the world. They serve over six million clients, making them the largest payment technology provider in the industry. In fact, they handle nearly half of all card transactions in the U.S. alone. They helped create Google Wallet, and are a part of most of the major innovations in the payment processing field today. There are both good and bad things about choosing to use the biggest payment technology service provider in the industry for your business. Many business owners don’t see any other choice, simply because First Data is the fastest provider of new technology in the industry. If your business relies on the ability to offer clients any and every way to pay, First Data will have the tools you need to support that service. Debit, credit, EMV, mobile payments, NCF, and any other form of payment you care to name are supported by First Data. First Data is relatively easy to sign up with. Their acceptance rate hovers around 99%. It does take a couple of days to get your account going, but there is no setup fee, unlike many other payment solution providers. There is also no PCI-compliance fee placed on the merchant. First Data is totally PCI complaint and uses plenty of top-quality encryption to protect all transactions. Their process and deposit times are on par with industry standards. Naturally, choosing the best of the best comes with a higher price, though. Both their per-transaction rate and their monthly fees are higher, and they do require a contract from all merchants. There is a penalty fee for leaving the contract before it expires. Every new merchant account is assigned a dedicated consultant that can be reached for customer service, but there is also a standard customer service line and a live chat option online for extra help. They offer online reporting features, check processing ability, the ability to create and utilize loyalty and gift card programs, and many, many other extra bells and whistles. One of the things that merchants need to watch for with First Data is their tendency to use billback billing methods, which means you may see charges on one month that were actually leftover from the last month, based on the way transactions are charged. It’s a complex system, but the point is that your final monthly bill may not reflect all charges for that month. However, if you are doing enough business that you need to utilize First Data’s enhanced tools and system, you likely are doing enough business to cover these costs regardless. First Data is the largest payment processor and the fastest provider of new technology in the industry. If you are operating a large business or enterprise, or you run an extremely successful mobile business, First Data is really the best payment processing solution for you. You can accept payments through any means necessary, and you’ll have all the extra features that make it easy to control the income aspect of your finances. The only reason that a business wouldn’t be a prime candidate for First Data is if they don’t do enough card or check business to cover the higher fees. In that case, there are many other, less powerful, but more affordable, options for payment processing. Have you had an experience with this company? Please share your First Data reviews below.